This review has not yet been approved by the owner of this writing service. If you are the webmaster of Writepro.net, please Contact Us to approve or remove this review. 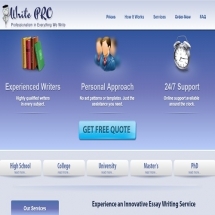 WritePro.net has a website typical for a company working in this industry. In other words, it is generic, decorated with cliparts taken from public sources, filled to the brim with barely readable filler text, and is only given enough functionality to give the visitor an opportunity to place an order and part with his money. Nothing much to write home about, although there certainly are much worse examples. Price per page ranges from $10 to $48, depending on how soon you want the job done and its academic level, which is more or less a median price in this kind of business. Perhaps the lower limit is a little lower than average, but not by much. Available by phone, chat and email. Whichever method you choose, an operator usually gets back to you fairly quickly, ready to answer your questions in passable English. All in all, there isn’t much to find fault with, at least until you want some really complicated issues to be sorted out. There are no writing samples offered by the company; it is only possible to judge its quality by the filler text found on its pages. On average, it is passable, at least if you take into account it was written without anybody intending it to be read by actual human beings. Normally filler text on such sites is barely intelligible mess; perhaps it is a sign that this one is a little more attentive to the image it creates. Some options are available for additional fees: 3 samples of your writer’s work, a copy of the sources used by the authors and progressive delivery (this option means that you pay for the order in instalments as it is being written, and receive it in the same manner). All in all, WritePro.net is a typical representative of the industry, without any major features that would distinguish it from dozens upon dozens of others. Customer support is mostly competent enough to sort out most problems, the website mostly manages to fulfill its purpose, design is forgettable but functional, prices are neither higher nor lower than the industry’s average – in other words, there is nothing to recommend either for or against using it.